Rick Prete is, according to the school, the first black head football coach at Roman Catholic. Rick Prete wasn’t a natural-born leader. When the fateful events of Sept. 11, 2001, occurred, he wasn’t a follower, either. An internal stirring mixed with doubts about life as a college student caused Prete, a freshman wide receiver at East Stroudsburg at the time, to join the Army. "I really didn’t know what being a leader was until I got into the military,” Prete said in a recent phone interview. 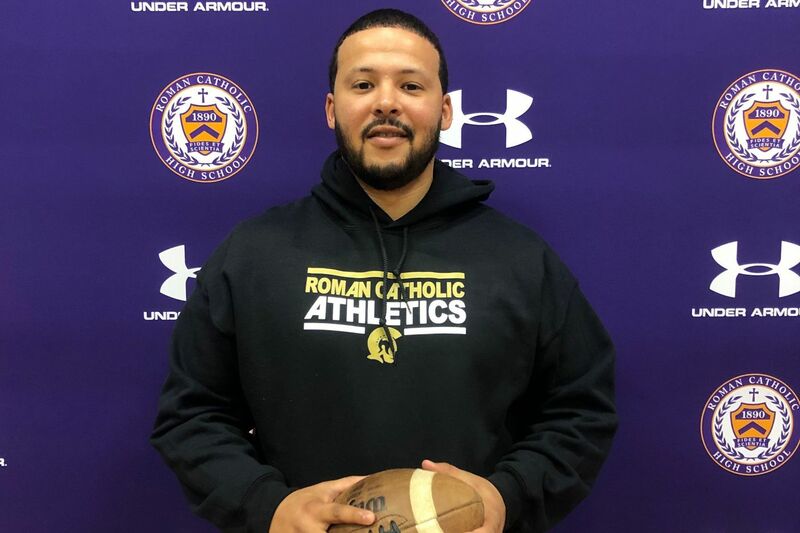 Now, Prete, 36, will lead the Roman Catholic football team. According to the school, he will become Roman’s first African American head football coach. Prete replaces Jim Murphy, who previously led the Cahillites from 2000-07, garnering a 64-34 overall record and a 32-22 record in the Catholic League. Since he returned in 2015, however, Roman struggled, finishing 9-36 overall and 4-16 in league play. Murphy stepped down in November. For the last two seasons, Prete was the offensive coordinator and receivers coach at Public League behemoth Imhotep. Before that, he was an offensive coach at Inter-Ac power Malvern Prep for the 2014 and 2015 seasons. He also coached a season at Plymouth Whitemarsh in 2012 and youth football in Conshohocken for several years. Prete was a standout receiver for Norristown High, graduating in 2001. Months later, he returned to his dorm room after class and found teammates transfixed by the TV as the terrorist attacks of 9/11 unfolded. “When I saw that,” he said, "it made me feel like I needed to do something. Prete acknowledged that academic struggles also made him question if college was for him. Ultimately, a familiar voice steadied the stirring. “Follow your heart,” he recalls his mother, Patty, advising. After the following semester, Prete enrolled in the Army, where he served from 2002 to 2014, finishing with the rank of staff sergeant. The work ethic and attention to detail the Army instilled in him, Prete said, have helped him as a football coach. Prete said he was honored to be Roman’s first head football coach of color but also felt a responsibility to show that race has nothing to do with mentoring or coaching. Roman Catholic has a long tradition of impressive football. Under Prete, the Purple and Gold should expect a program that will make the alumni proud on and off the field, he said. He also thanked his wife, Gabriela, and daughters Arianna, 13, and Nylah, 9, for allowing him to also devote himself to football. Prete, however, hopes football at Broad and Vine can be special, too.